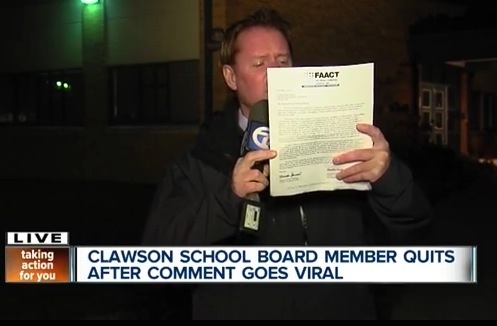 11/25/14: Clawson Public Schools Board of Education President, Kevin Turner, contacted FAACT to share that the Board Member who made the offensive comment about children with food allergies has voluntarily resigned and that they take food allergies seriously. We are waiting to hear from Superintendent Beels and whether Clawson Public Schools will accept FAACT's offer for free food allergy education throughout their district. Below is the letter that FAACT sent to Clawson Public Schools the evening of November 24, 2014, which is also shown in ABC's Channel 7 News story. We at Food Allergy and Anaphylaxis Connection Team are greatly concerned with a video of your school board meeting discussion of students with food allergies and a board member’s comment “well you should just shoot them.”Additionally concerning is the laughter of other members and persons present at the meeting following this remark. Food allergies affect approximately 15 million Americans, including six million children. The prevalence of food allergies appears to be increasing among children under the age of 18; that is 2 students in every classroom. There are about 200,000 emergency department visits per year – a food allergy reaction sends someone to the emergency department every 3 minutes, and every 6 minutes the reaction is one of anaphylaxis. The U.S. Department of Education, Office of Civil Rights (OCR) and the U.S. Department of Justice have determined food allergies may be deemed a disability that requires accommodation under federal disability laws and regulations, including the Americans with Disabilities Act and Section 504 of The Rehabilitation Act of 1973. Additionally, the OCR issued a “Dear Colleague” letter on October 21, 2014 that reminds schools that the bullying of a student with a disability may result in the denial of a free and appropriate public education and addresses the school’s obligation in remedying the bullying and its effects. The letter confirms that such bullying need not be peer to peer for the student to be protected, but includes bullying by teachers and administrators. In today’s times of school shootings and the increased awareness of bullying and the effects of bullying, it is astounding to hear any person in authority make such a cavalier, insensitive, and offensive “joke” about students with disabilities. We do not expect that such a remark would have been tolerated, much less laughed at, if it were made about students with other disabilities. Furthermore, the acceptance of such comments from one of your highest school officials would lead one to question whether this dismissive attitude towards life-threatening food allergies is pervasive throughout your district. It is very concerning that no remedial action has been taken since this remark was made, not even an apology. One would hope that this is due to a mere lack of education regarding food allergies. As such, FAACT would like to offer education seminars for your board officials, as well as district-wide staff seminars. We would like to help you resolve this glaring issue and are willing to offer our services free of charge. We hope that you will accept this offer, as we work with many national education organizations. We look forward to hearing from you, as we know you will attempt to rectify this situation.